- This property comes with 5 dedicated parking spots. DETAILS: This stunning new construction home features 6 bedrooms, 6.5 bathrooms, a private heated pool, and incredible accommodations for 18 guests. Two lavish king bed guest rooms with private en-suite bathrooms welcome guests on the first floor. A spacious, open floor plan joins the living, dining, and kitchen areas. Home cooks and entertaining enthusiasts will love the gourmet kitchen, which is perfectly equipped with spacious countertops, tons of bright white cabinetry for storage, and premium stainless steel appliances. The nearby dining area offers seating for 8+ guests. Luxurious furnishings and a large flat-screen television make the living area a wonderful place to relax after a long day in the sun. French doors lead to the outdoor oasis, which offers a wonderful place to enjoy the coastal breeze with a morning coffee. A private, sparkling pool offers a great place to splash the day away (and can be heated seasonally for an extra fee), and the pool deck and surrounding outdoor area create a wonderful place to relax and enjoy a grilled dinner around the patio table with seating for 8. On the second floor are three guest rooms offering a variety of sleeping arrangements. The beautiful master suite boasts a lavish king bed and a spacious en-suite bathroom with a shower, separate soaking tub, and a large dual sink marble vanity. The second guest room features a beautiful upholstered king bed, a mounted flat-screen television, and a private bathroom with a shower and a marble vanity. The bunk room offers a twin-over-full built-in bunk bed and a twin-over-twin built-in bunk bed with a private bathroom. Steps lead to the third-floor loft area which offers a table and chairs (perfect for a game of cards) and a family room with a spacious, plush sectional sofa and a large mounted flat-screen television. Also on the third floor is a bunk room with three sets of built-in twin-over-twin bunk beds and a private bathroom with a glass-front shower and a vanity with dual sinks. Guests will love the stunning emerald coast views from the third-floor balcony. Guests can enjoy a day on the sugar white sand beach just a short walk away, and the home’s 7 custom 360 Blue beachcruiser bikes give guests a great way to explore the charming coastal towns along 30A. Treat your family to an unforgettable 30A getaway—contact 360 Blue today to book your stay at 16 Sandcastle Court! Perfect spot for our retreat!!! The guest rooms are spacious and comfortable! Loved the house and the location. We will be using this property again for a future retreat! Our stay at Blue Phoenix was nothing short of fabulous! 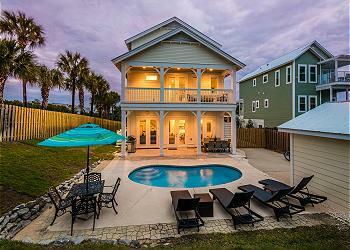 The house is gorgeous and brand new...situated right on 30A in beautiful Blue Mountain Beach. The area is close to plenty of shopping, restaurants, and nightlife without being crowded. You are just a short walk to the beach and if you tire of that you can easily ride one of the bikes provided to Grayton , Watercolor, Seaside or beyond! The bedrooms are all very nice and have their own baths , which was great for our group. Loved the brand new furnishings and very comfy beds! We had an amazing relaxing getaway and will definitely be back! We are so delighted that you enjoyed your stay with us in Blue Mountain Beach! We agree that this home has it all and the location cannot be beat! Thank you for staying with 360 Blue, we hope to see you again soon! Blue Phoenix provides the perfect space for a large gathering! Our extended group of college girlfriends enjoyed a wonderful girls trip in Blue Mountain Beach, a place near and dear to my heart. Blue Phoenix is a beautifully decorated and well-equipped brand new home, just a short walk or bike ride from the beach. Bonus, the bikes came with the rental! Every bedroom has a bathroom so we all had privacy and plenty of room to spread out. There is a ton to do in the area from water sports to restaurants to just hanging out and relaxing. The outdoor space and pool made a perfect space for happy hour. I highly recommend booking and look forward to coming back and making many more memories! 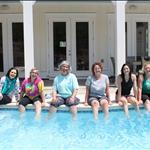 We are so glad that you enjoyed your girls getaway with us at this amazing home in Blue Mountain Beach! We agree that this home has it all and the location is perfect to enjoy the beach and all the wonderful surroundings of Blue Mountain. Thank you for staying with 360 Blue, we hope to see you again soon!